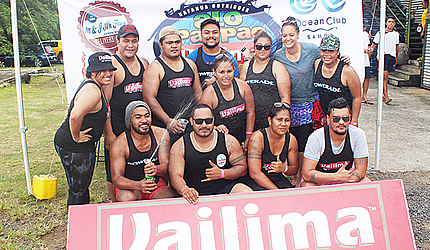 Some twenty businesses took the challenge last Saturday to hit the water for Vailima Breweries Nafanua Outrigger Business House Regatta. Held at the waterfront on Beach Road, the event organized by the Nafanua Outrigger Club to raise funds to promote its junior paddling programme was a huge success. Prior to the day of competition, most of the teams had been taught how to paddle and had been training for several weeks under the guidance of the Club’s senior paddlers. So on Saturday, it was time to put their skills to the test against their peers in an environment of fun but at the same time fairly competitive. Team Bluesky won the overall competition edging strong challenges from Team A.C.P and M&J Ah Fook. Nafanua Outrigger Canoe Club’s President, Mamea Samuel Ieremia, said the event was a real celebration for paddling and an opportunity for everyone to have some fun. The competition’s main sponsor was Vailima Breweries.